Cottage cheese and peas cooked in mild spicy sauce. Heat oil in a pan, add the aniseed , bay leaf, and cinnamon, saute them. Add the chopped onions, saute until they turn translucent. Add green chillies,saute for a min. Add the tomatoes and cashews along with turmeric ,coriander,chilli and garam masala powders. Mix them well. saute them well until the tomatoes gets cooked well. Allow it to cool and grind them to a smooth paste adding little water. Now coming to the gravy part. Heat a tsp. of ghee , in a pan and fry the paneer until golden brown. Heat oil in a pan, add the peas and dry fenugreek leaves, saute them for 3 mins. Now add the grinded paste and allow it to cook with the peas for about 5 - 10 mins. Finally add the cream and the paneer cubes along with salt,allow it to cook for 10 mins. in low flame. I have tried this once and we loved it..urs is tempting me to try again..will try once.. Very nice and wonderful preparation of mutter paneer. Looks delicious, yummy and tempting. 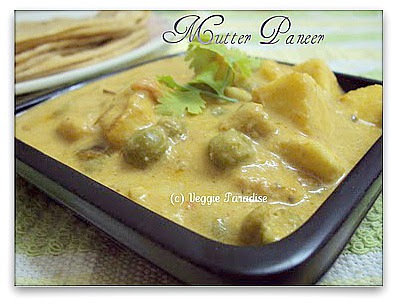 mouth watering mutter paneer..very eye catching pic.. 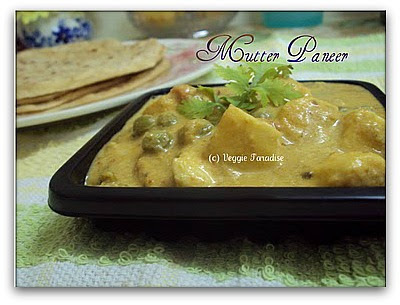 Mutter paneer looks creamy and yummy. I've heard of paneer before and this really looks delicious. We love this curry..yours looks delicious Aruna..Love with rotis.. Wonderful mutter paneer...looks delicious Aruna..superb dear. Your mutter paneer gravy looks delicious Aruna. So rich and creamy. Paneer is my daughter's favorite.Pic looks just perfect. looks so creamy and delicious.. 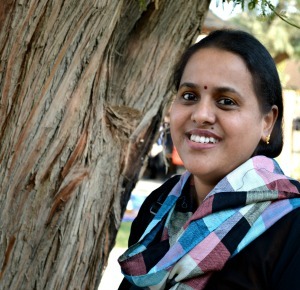 Very nice looking sabji,loved the click too. I will keep following keep up the great work!!! Love this mattar paneer recipe! It looks so very delicious!! 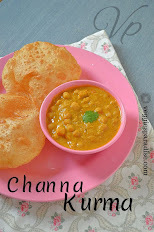 Aruna,, paneer peas masala rombha super ah seithurukeenga dear,,,rich n creamy goes well with rotis. All time favorite! Looks too good and the picture is inviting! Love mutter paneer. Just looks lovely and yummy. Perfect paneer muttar, cremay and rich. So delicious matar paneer...one of my fav..beautiful clicks. Its a very beautiful presentation that spells out the taste. Love the creamy gravy, so gorgeous.